I was heading to the desert to meet up with Brian French for four days of the usual and had Friday on my own for a warm-up. I had slept the night at South Lake near Isabella Lake, intending to hike some peaks in the area in a 7-mile loop. Much of the area had burned the previous summer and I thought it might be a good time to tag some of these summits, usually thick with brush. In the morning I could see that the upper reaches of the loop I had planned had not in fact burned, and the brush looked as uninviting as ever. Rather than fight that stuff, I headed east to the Canebrake area to do some unnamed peaks in the Owens Wilderness on the west side of the Sierra Crest and Walker Pass. The slopes here are drier and consequently no serious brush to contend with. 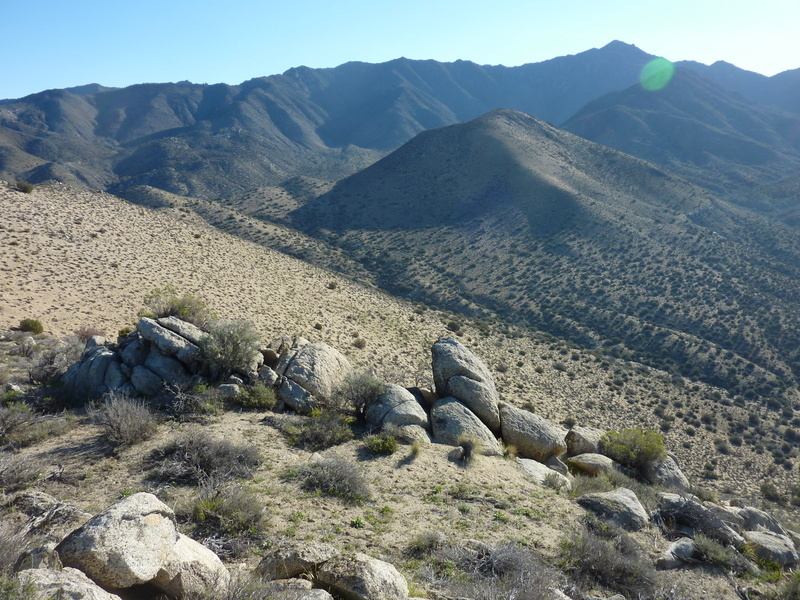 The lower slopes are populated with Joshua Trees while the upper elevations are characterized by juniper and pinyons. Like most summits in the Walker Pass area, there is a great deal of sand in these hills, making for a tough workout when the slopes get steep and rather enjoyable on the descent. I parked at Bert's Park, a BLM day-use area with shade trees and picnic tables along SR178. The four peaks I visited were on either side of Berts Canyon, which led me to believe that Bert must have been one of the original white homesteaders in the area (he also has an OHV road in the area named for him). The first peak was the lowest at 4,962ft and the easiest, taking only 40min to reach. The air was fairly clear today with high, thin clouds, making for good views. Another 40min saw me along the ridgline to the second summit, Peak 5,353ft. I found an old, rusted tobacco tin on the slope below the summit, another reminder that no matter how obscure a peak I climb, someone's already been this way before me. The third peak was the highest and closest to the crest, rising to over 6,600ft. Pinyons and junipers were the dominant trees on all the slopes save the warmer southern exposures. From the summit of Peak 6,652ft I was surprised to find I was less than half a mile from the PCT which goes over the saddle between this peak and the 8,453-foot Owens Peak, another mile and a half ENE. With more energy and ambition I could have continued to Owens, then south to Jenkins Peak before descending the ridge on the south side of Berts Canyon, but having already been to both of those and not possessing the requisite ambition, I took the shortcut across Berts Canyon to hit Peak 6,398ft more directly. The "shortcut" wasn't exactly easy, dropping 800-900ft between the two and taking almost an hour.